States shaded in Yellow are one business day transit. States shaded in Tan are two business day transit. States shaded in Green are three business day transit. States shaded in Maroon are four business day transit. States shaded in Orange are five business day transit. States shaded in Pink are one business day transit. States shaded in Light Blue are two business day transit. 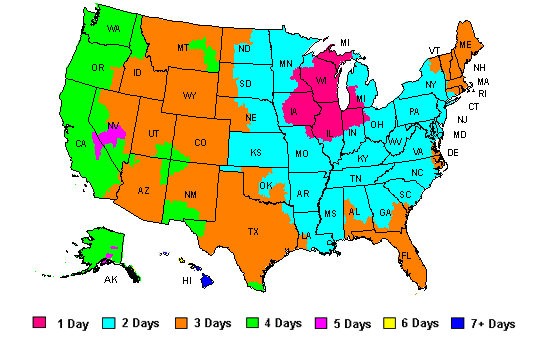 States shaded in Orange are three business day transit. States shaded in Green are four business day transit. States shaded in Purple are five business day transit. States shaded in Yellow are six business day transit. States shaded in Dark Blue are seven plus business day transit. We have a $4.00 handling charge per package sent. This charge covers all packing materials and labor needed to process each order. This charge is ALREADY INCLUDED in each shipping cost. Because we are shipping perishables, we use Monday and Tuesday as our primary shipping days. This allows extra time for your package to arrive before the weekend, as UPS does not normally deliver on Saturday or Sunday. If a Saturday delivery is needed use FedEx home delivery as they do deliver on Saturdays. Shipping requests for Wednesday or Thursday may require additional UPS/FedEx Air Service charges depending on destination and weather conditions. Be sure to ORDER EARLY during the holiday season! Online orders will be processed as quickly as possible. If sending to more than one address, a separate order must be placed for each one. You may also fax multiple orders to us at 608-846-4793. Please be sure your addresses are current.UPS will not deliver to a P.O. Box. We need a physical street address and house number. If the package is to be delivered to a rural route, please add the name of the road and include a phone number. We cannot be responsible for shipping delays or for non-delivery when the address given to us is incorrect or incomplete. We cut all of our bulk cheese by hand. We get as close as possible to the weight ordered. All bulk cheese cuts are approximate. Our product prices do not include shipping costs. We ship our products via UPS and FedEx. Due to the perishability of our products, we recommend using UPS/FedEx overnight during hot weather. Ground Service is usually sufficient when packages are being sent to states that border Wisconsin….provided that the weather is not too HOT. We do not ship to any other countries other than the United States.